Listen to this Indian story and learn how to use 'adverbs' to describe how things happen. 이야기를 잘 듣고 ‘adverb’ 사용법을 영어로 배워봅시다. 이번 시간에는 현자와 딸의 결혼식에 대한 이야기를 들어보겠습니다. 그런데 이 이야기는 반전이 있어요! 이야기를 듣기 전에 Session Vocabulary를 살펴보고 단어 뜻을 확인해봅시다. 1. 매로부터 구해준 동물은 무엇이었나요? 2. 현자는 딸을 누구에게 데려갔나요? 3. 결국 딸이 결혼하려고 한 상대는 누구였나요? 안녕하세요? The Storytellers에 오신 것을 환영합니다. 저희 프로그램에서는 전세계의 이야기들을 들어보고 영어도 배우는 시간을 가지고 있습니다. 저는 손보람입니다. 오늘의 이야기는 인도 이야기 인데요. ‘생쥐의 결혼식’ 이야기입니다. ‘Sage’ 현자와 처음에 ‘a mouse’생쥐였던 ‘his daughter’그의 딸에 관한 이야기에요. 이야기를 듣기 전에 여러분의 이해를 돕기 위해 몇 가지 단어를 알려드릴게요. ‘A hawk’ 매, ‘transform’ 변신시키다, ‘old enough to marry’ 결혼할 나이가 된, ‘a husband’ 남편입니다. 과연 딸이 아버지가 찾아온 신랑감들을 마음에 들어 했을지, 이야기를 한번 들어볼까요? Once a sage was washing in a river when a hawk suddenly dropped a mouse into his hands. To save the mouse from the hawk, the sage quickly transformed the mouse into a beautiful baby girl and took her home to his wife. The couple did not have any children, so they happily adopted the baby. When the girl was old enough to marry, the sage and his wife decided to find the best husband for her. The sage proudly took his daughter to the Sun God. But the girl said no. Then the sage met with the King of Clouds, then the King of Winds and the King of Mountains. But the daughter said no to all of them. 자, 잠시만요. 지금까지 이야기는 매가 생쥐 한 마리를 현자의 손에 떨어뜨렸고, 현자는 생쥐를 지켜주기 위해 자신의 딸로 변신시켰습니다. 그리고 딸이 결혼할 나이가 되자, 딸이 자랑스러운 이 아버지는 딸을 태양의 신과 구름의 왕, 바람의 왕, 산의 왕에게 데려갔죠. 딸이 이들 중 하나를 자신의 남편으로 삼았으면 하고 말이죠. 하지만 딸은 모두 거절했습니다. 이 이야기 속에서 몇몇 단어가 등장인물들이 어떻게 행동하는지를 말해주고 있는데, 혹시 눈치채셨나요? 이 부분만 다시 들어볼게요. A hawk suddenly dropped a mouse into his hands. The sage quickly transformed the mouse into a beautiful baby girl. They happily adopted the baby. The sage proudly took his daughter to the Sun God. 이야기 속에서 네 단어가 행동을 묘사하기 위해서 쓰였습니다. 이런 단어를 부사 ‘adverb’라고 합니다. 부사는 동사를 꾸며주는데, 그 예로 ‘suddenly’ 갑자기, ‘quickly’ 빨리, ‘happily’ 행복하게 그리고 ‘proudly’ 자랑스럽게..가 있습니다. 이제 다음에 어떤 일이 벌어지는지 들어볼까요? 도움이 될만한 단어 몇 가지를 알려드릴게요. ‘power’ 능력, ‘strengths’ 힘, ‘true nature’ 본성, ‘inside’ ~의 안/속에..입니다. 과연 딸은 결혼을 할 수 있을까요? ‘I do not care about the powers and strengths of the Kings’, the daughter quietly told her father. The King of Mountains heard this and said that the King of Mice was maybe a good choice for the girl. When the sage’s daughter met the King of Mice, she immediately wanted to marry him. The sage could see that his daughter’s true nature had not changed, and that inside she was still a mouse. 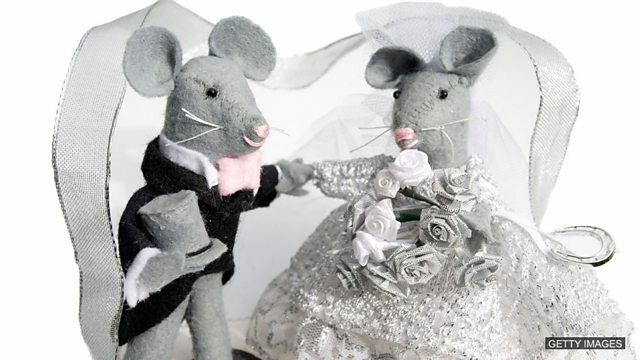 So the father sadly but carefully transformed his daughter back to a mouse and the happy couple got married. 결국 딸은 자신과 동족인 쥐들의 왕을 만나 진정한 사랑을 찾게 되었네요. 행동을 묘사하는데 사용된 부사를 다시 한번 들어보겠습니다. She quietly told her father. She immediately wanted to marry him. The father sadly but carefully transformed his daughter back to a mouse. 이번에는 ‘quietly’ 조용히, ‘immediately’ 즉시, ‘sadly’ 슬프게, ‘carefully’ 조심스럽게.. 라는 부사를 들었습니다. 다음 주에도 또 다른 이야기와 함께 영어 배워보아요. Try and use these adverbs to tell us something about an event that happened to you! Come and tell us in our Facebook group! 저희 Facebook 그룹에서 부사를 사용하여 자신에게 있었던 일에 대해 이야기해보세요!